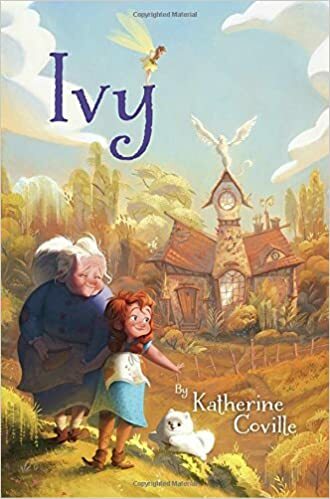 Summary: Ivy and her grandmother live in the messiest cottage in Broomsweep…messy, because her grandmother is Meg the Healer, whose large garden and knowledge of plant medicines have made her a famous doctor of humans and animals. Rumor has it that the new queen is traveling through her kingdom to find the best town. Ivy and Grandmother are under pressure from the mayor’s wife to get their property up to the standards of the rest of Broomsweep. When an injured griffin, a dragon with a severe head cold, and a flock of pixies arrive, cleaning up seems like an impossible task. But Grandmother assures Ivy it will all work out. And when four trolls invade the village at the same time the queen shows up unexpectedly, it all (eventually) does. 144 pages; grades 2-4. Pros: A cozy fantasy with a fairy-tale feel and a happily-ever-after ending. A large font and plenty of illustrations make this a good choice for early chapter book readers who are ready to move on from the Magic Tree House. Cons: Not too many surprises in this fairly predictable tale.